Games User Research/Experience focuses on players’ psychology and their behaviour via techniques such as playtesting, analytics, expert analysis, UX design, and others. Game User Researcher and Experience professionals aim to help provide players with the best gaming experience possible. 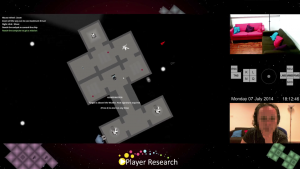 Games Research is also an academic area which seeks to better understand what motivates players, how their actions can be explained or predicted, or even just to find new ways to capture and use data about players to help with game design. Games Research relates to psychology, human factors and ergonomics, user experience design, interaction design, computer science, and many other fields. Games Researchers and user experience professionals in all of these fields, inside and outside of academia, come together around a love of gaming, players, and making awesome games. The Games Research and User Experience SIG of the IGDA a professional body, and has held an annual conference in San Francisco every year since 2010, following the foundation of the group in 2009 (known as the GUR-SIG at the timne). The first European conference was held in London in 2015. The GRUX-SIG LinkedIn group is comprised of more than 1000 professional researchers, game developers, and academics, all aiming to understand players and help developers create the experiences that they aim to deliver. Games User Research Summit Presentations. This page updates with full videos of presentations from the annual #gamesUR Summits, dating back to 2010. Where experts from all over the industry come together to discuss and share new findings. Game Analytics SIG: Game analytics using ‘big data’ to inform game design. Accessibility SIG: Game accessibility professionals working to make games playable for everyone and take special considerations for gamers with disabilities of any sort. Community Management SIG: Community Managers who poll, survey and speak to players to gather feedback. Fair Play Alliance: The Fair Play Alliance is a cross-industry initiative spanning over 70 gaming companies whose mission is to share research and best practices that drive lasting change in fostering fair play in online games.